The Myers-Briggs ESFP (Extroversion, Sensing, Feeling, Perception) personality type is creative, spontaneous, and energetic. These “artists” love to dance, sing, and lose themselves in exciting moments. Not only do ESFPs lose themselves in the moment, but they expect others to feel these sensations as well. A part of their enthusiasm lies in spending time with others and encouraging them. Their energy allows them to help others, and they are natural motivators. The artist maintains a spotlight wherever he or she may go. They love to be the center of attention, and their charming style and wit attracts others. In fact, many celebrities adorn the ESFP personality. One of the more appealing aspects of an ESFP personality type is that they make every occasion feel like a party. On a more serious note, a person with an ESFP personality is sensitive to others and observant of their needs. 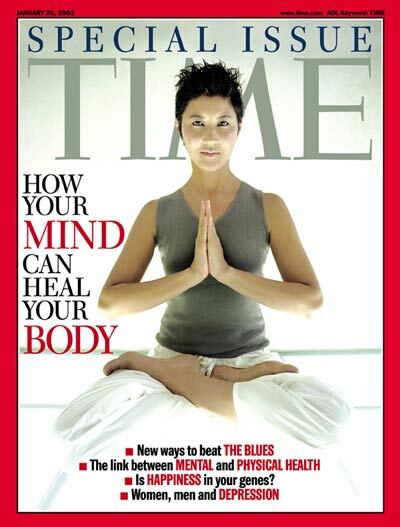 This sensitivity may be cause for their greatest weakness—avoiding confrontations at all costs. However, their trustworthiness and emotional support make them great friends. As long as an ESFP is with good friends and is doing something they are passionate about, they will thrive. Making up approximately 9 percent of the general population, ESFPs are considered good employees. They work hard to boost morale in their departments and at their companies. Their objective is to make the work environment positive through their social intelligence and easy-going temperament. They are also supportive and encouraging of their co-workers. Employers would be wise to use ESFPs as motivators for other employees, because they naturally inspire others to do their best and get the job done on time. 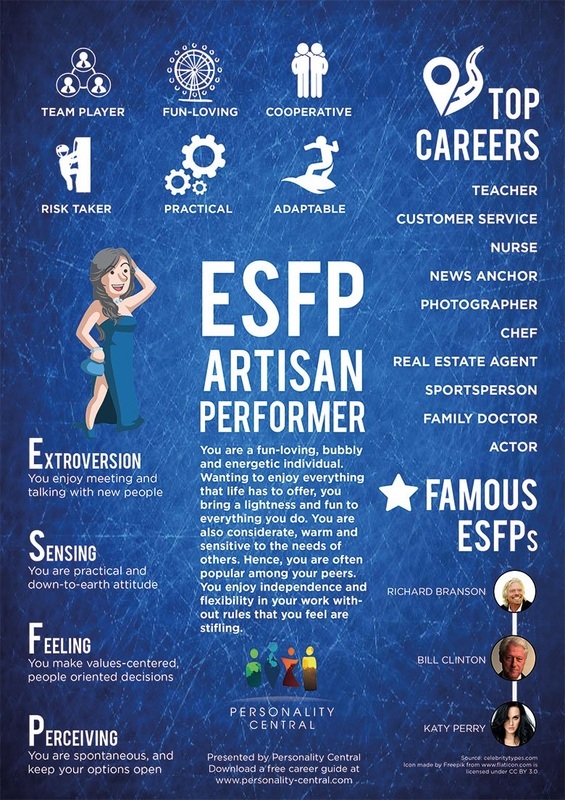 ESFPs are fun, enthusiastic workers, who are witty, honest, and sensitive toward others. As long as ESFPs are aware of their assigned tasks and deadlines, they will complete any job per expectations. The more freedom they have at work, the more productive they will be. They prefer autonomy, and they thrive in a fast-paced, chaotic environment. These individuals excel at jobs when they can use their creativity, but they also tend to be unpredictable, which can cause problems at work. They abhor mundane and repetitive tasks. ESFP personality types excel at jobs that allow them to work with others. They also enjoy helping others and getting to know a variety of people; therefore, the best jobs for this personality type are counselors, social workers, nurses, coaches, business consultants, EMTs, paramedics, singers, dancers, actors/actresses, comedians, event planners, tour guides, sales representatives, and travel agents. ESFPs tend to have good relationships, because they are free-spirits, who like to have fun. They live in the present and try to make every situation positive and enjoyable. These same characteristics lend themselves to boosting romantic relationships. ESFPs are creative and energetic, which most people crave when dating. However, it is important for their partners to note that these individuals are not the type who plan for the future. Their desire to entertain and their ability to live in the present may make them seem unpredictable. However, they are highly sensitive, calm, and understanding partners. ESFPs also make good friends. They are supportive, encouraging, sensitive, fun, charming, stylish, popular, witty, and exciting. ESFPs are always looking for new experiences, so it is nearly certain that excitement and fun are close by. They tend to have a huge clique of friends, and those friends always have a good time when ESFPs are around. Unfortunately, these individuals sometimes come across as shallow and self-centered, when in reality they are anything but. Being highly sensitive, their feelings may be easily hurt, especially when others criticize them. ESFPs are fun parents, who are also easy-going and spontaneous. They are supportive and encourage their children to be brave and explore the world. They also love to spend time with their children, watching them grow and mature. They enjoy surprising their children with small gifts. Warm and affectionate, they go out of their way to make sure their children know they are loved and accepted, unconditionally.